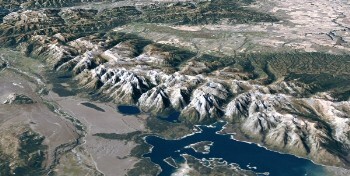 Mountain systems characterized by folding, such as the Teton Range of the Rocky Mountains, have been the intensively studied and debated since the 19th Century. The age-old problem of fold-mountain formation reduces to this question: How can one account for the “extra” surface area, contained within the continental boundaries, that observations reveal folded atop other layers? For decades, in the plate tectonic view, mountain-building has been attributed exclusively to plate collision, which is thought to “elongate” the continent, whereas in the Earth-expansionist view, it is uplift from beneath with gravity sliding and gravity spreading. In a paper published in the May 25, 2012, issue of Current Science, J. Marvin Herndon deduces “a more fundamental, general consideration from Earth’s early formation as a Jupiter-like gas giant”. Contrary to the planetesimal theory, the article asserts, Earth’s complete, protoplanetary condensation initially formed a gas-giant planet virtually identical in mass to Jupiter. T-Tauri outbursts by our young Sun, Herndon posits, stripped the gas from the inner four planets. A rocky Earth remained that had been compressed to about 64% of present diameter by the 300 Earth-mass weight of primordial gases. As described in the article, the subsequent whole-Earth decompression caused changes in surface curvature, leading to “extra” continent area that acted to “flatten” itself, to reduce need for increased surface area by “buckling, breaking, and falling over upon itself”. This buckling, breaking, and falling over upon itself, Herndon asserts, is the principal agent involved in the formation of fold-mountains. The article proffers the additional suggestion that decompression-generated, peri-continental tension-fractures, “initiated the formation of submarine canyons and drainage channels; later, erosion-processes did the rest”. Origin of mountains and primary initiation of submarine canyons: the consequences of Earth's early formation as a Jupiter-like gas giant. (click here for pdf) Current Science, 2012, 102, 1370-1372. + In espanol haga clic aqui.